My husband had a dozen red roses delivered to me about a month after we started dating. It was a sweet, romantic gesture that I’ll always remember. And on many Valentine’s Days after we were married, he’d have a dozen red roses delivered to me at my office. While I appreciated the beautiful flowers, I also paid the bills. And the following month, when I saw the outrageous price he’d paid for roses on Valentine’s Day, I’d cringe. He wouldn’t be deterred, but now that I work from home (and earn far, far less than I used to), I’ve convinced him to curtail the rose deliveries. Besides, wouldn’t you rather have chocolate? According to a new study, eating chocolate can help you stay thin. What? Is this an early April fool? Nope, researchers at the University of California-San Diego found that people who frequently eat chocolate have lower body-mass indexes than people who don’t. Other evidence suggests that chocolate can ward off strokes, heart attacks, and diabetes. So here are ten reasons to indulge tomorrow (unless you gave it up for Lent, not realizing that Lent starts today – oops). 1. Chocolate decreases stroke risk. A Swedish study found that eating more than 45 grams of chocolate per week—about one and a half ounces—led to a small decrease in stroke risk among women. Chocolate contains flavonoids, whose antioxidant properties help fight strokes, according to the study’s author. 2. Chocolate reduces the likelihood of a heart attack. Other studies have shown that eating small amounts of chocolate prevents blood clots, which in turn reduces the risk of heart attacks. Blood platelets clump together more slowly in chocolate eaters, the studies say. 3. Chocolate protects against blood inflammation. Eat one small dark chocolate bar per week, and your risk of heart disease will decrease, according to a 2008 study. About a quarter-ounce of dark chocolate per day keeps the blood inflammation-inducing proteins away. 4. Chocolate helps with math. This is true! Flavanols (a class of flavonoids found in chocolate) helped people with their mental math. The findings suggest students who eat chocolate before an exam may gain a real benefit from doing so, according to the British Telegraph. 5. Chocolate may prevent cancer. Cocoa contains a compound called pentameric procyanidin, or pentamer, which disrupts cancer cells’ ability to spread. When researchers from Georgetown University treated cancer cells with pentamer back in 2005, the proteins necessary for cancer growth were suppressed and the cells stopped dividing. 6. Chocolate is good for your skin. Remember when you were a teenager and everyone thought chocolate led to acne? Well, not only does it not cause breakouts, dark chocolate is actually good for your skin! Flavonoids found in dark chocolate protect women’s skin from the sun’s UV rays, according to German researchers. But that doesn’t mean you should skip the sunscreen. 7. Chocolate can control coughs. One of chocolate’s chemical components, theobromine, seems to reduce the activity of the vagus nerve, the part of the brain that triggers coughing fits. Next up? Chocolate cough syrup – way better than that orange stuff my mother forced down my throat. 8. Chocolate may improve blood flow. In 2008, test subjects of a Harvard study ate large amounts of chocolate for two weeks (oh, poor things). Fourteen days of pigging out on chocolate, they found, sped up blood flow through the subjects’ middle cerebral arteries. In other words, more chocolate means more blood to your brain. 9. Chocolate strengthens your brain. 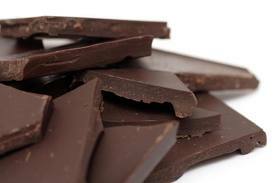 Researchers found that dark chocolate shields cells in your brain, and protects the brain from damage caused by stroke. Epicatechin, a compound found in chocolate, significantly reduced the brain damage in mice who suffered strokes and that same compound improved mice’s memories. 10. Chocolate makes you live longer. Jeanne Louise Calment lived to the age of 122. Supposedly, she ate two and a half pounds of dark chocolate each week. So if I follow Madame Calment’s example, I could be around for my 100-year college reunion. But don’t just buy any old chocolate. Most of the chocolate you buy in the grocery store is heavily processed, which means that it has lost many of its healthy chemicals. Buy the good stuff. A small amount of good, dark chocolate (look for 72% cacao or higher on the label) is best. Happy Valentine’s Day! The Quesadilla Explosion Salad from Chili’s has 850 calories, 45g of fat (21g saturated), 2,230mg of sodium, and 60g of carbs. Oh, and their Guiltless Grilled Chicken Pita has just 550 calories and 9g of fat, but 2,110mg of sodium. Panera’s Asian Sesame Chicken Salad (my favorite) is 470 calories, 25g of fat (4g saturated), 560mg of sodium, and 31g of carbs. It’s a salad! High in salt and carbs for a salad. And no longer will I order the Cream of Chicken and Wild Rice Soup: 310 calories, 1,470mg of sodium, 29g carbs. I’m not a big fan of the Cheesecake Factory, but I know a lot of my friends are. Watch out for the Spicy Cashew Chicken. Your dish has 1,810 calories and 4,450mg of sodium. In one serving. According to the Mayo Clinic, the biggest risk of a high-sodium diet is the effect it has on blood pressure and heart health. Hypertension/high blood pressure, heart disease and kidney failure are some of the long-term effects that can result from long-term, high-sodium intake. In the body, sodium is processed by the kidneys. However, when a person eats too much sodium, the kidneys cannot process all of it. The excess sodium ends up in the bloodstream. Because the mineral retains water, the volume of blood in the body increases. As a result, the circulatory system has to work harder to pump the blood. Over time, this added strain on the system can result in heart disease and kidney failure. Since February is Heart Health month, this is good information – not to scare you (well, maybe a little), but just to let you know that knowing what goes into your body is important. I’m learning, too – and as much as I like to go out to eat, I’m going to be much more prudent about my choices. Is Your Body a Garbage Disposal? I know, I know, it’s Super Bowl Eve, and tomorrow, following the grand traditions of Thanksgiving and Christmas, people all across America will gorge themselves on beer, chicken wings, pizza, nachos, and all sorts of fat and sodium-laden food. Oh, go ahead – indulge if you want. I’ve certainly done my share in past years. I thought about writing on this topic tonight after seeing a friend’s post on Facebook. She indicated that she’d eaten a “5 Guys bacon cheeseburger with all the fixin’s and enough fries to satisfy three normal people.” Her statement prompted me to look up the nutrition information online. Well, that bacon cheeseburger has 920 calories, 62 grams of fat (30 of them saturated), 1,310mg of sodium, and 51 grams of protein. The “regular” fries (not the large) will get you an additional 620 calories, 30g of fat, and 90mg of sodium (that seems low for fries, but okay). So the burger and fries, which is presumably only one meal, contains 1,540 calories (nearly your daily allotment unless you’re a super athlete), 92g of fat, and 1,400mg of salt. (P.S. I should not have shared this information with her; she wasn’t at all pleased with me). No wonder we’re so unhealthy. This year I let my husband know that we’ll be making an effort. No pizza! No eating all day (he’s working anyway, but should be home in time for kick-off). I’ll be making fajitas, using salt-free spices, lots of onions and peppers, thin-sliced lean beef, low-salt salsa, and black beans with cilantro and lime. Because I struggle with my food choices every single day. And while none of us wants to feel deprived (deprived? really? we all have so much food to eat, don’t we? 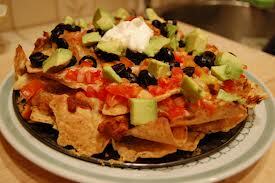 ), there are options to keep the food choices reasonable. And keep the sodium levels down! With the Patriots out, I will root for San Francisco to win, for Beyoncé to sing well live, and for memorable commercials. 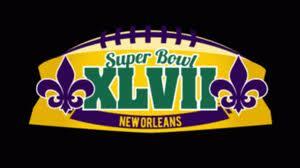 Happy Super Bowl!